Fortunately, we live in an age where good frame fit information is readily available either in catalogs or on the internet. Many numbers can be taken right off of published geometry tables. Stack and Reach: The Stack and reach concept is becoming most popular standard for describing frame geometry: Stack and Reach are the x/y coordinates of the top-center of the head tube in relation to the bottom bracket. The bottom bracket location would be considered the “origin”, with coordinates 0,0. The Y coordinate is the stack, while the X coordinate is the Reach, as shown at right. 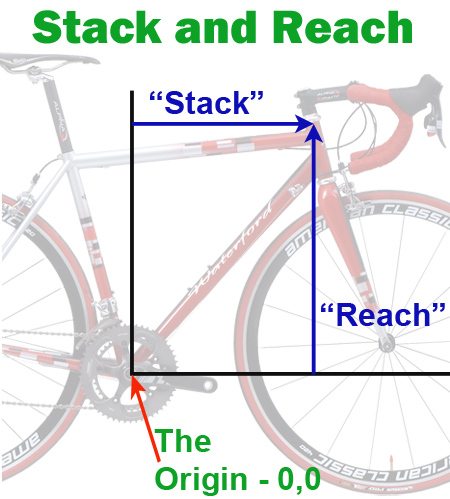 Stack and reach is independent of the top tube slope, alleviating much confusion about how to compare one size and/or brand to another.